A core principal at credit unions is superior member service. Credit unions take pride and promote the fact that they can provide better service than the impersonal touch of major banks. Local breweries stand out in my mind for service. Often, it is possible to find a comparable (or even the exact same) beer for sale at a liquor store or on tap at a bar nearby (think competing branch or ATM). Yet, every day, locals are willing to go out of their way to spend time and money at the brewery’s taproom. This is not because the beer is better or because of dining options as these venues often do not even serve food. The difference is in the experience. At craft breweries, I regularly have the opportunity to speak with beer-tenders, brewery owners, and even the brewers themselves. They take pride in their tap lists, and their enthusiasm is visible when they discuss the beer, even if they have had the same conversation thousands of times already. Websites and printed lists provide detailed descriptions of the offerings, but the staff behind the bar is happy to listen to a visitor’s preferences/tastes, and provide personalized recommendations based on these factors. Often, the servers will even offer small samples of the beer so the customer can feel confident in the decision prior to purchasing a pint. This type of service creates a very welcoming experience, and whether I am seeking that level of service or not, I am happy to support and recommend the business to others. Member service, as we know it, is changing. It is not realistic for the front-line staff at a credit union to know the faces and lives of each member that walks into the branch. There is an increasing use of online/mobile banking, and members are fair to expect a convenient and highly personalized experience across all channels because that is what they get from Amazon, Starbucks, and other companies they interact with frequently. With effective data analytics, credit unions have opportunities to gain a great understanding of a customer and his/her needs without that person ever walking into a branch or speaking with a representative. It is important to remember, whatever the channel, member service is an ongoing engagement, and every impression matters. Of course, the credit unions community differentiates itself and takes pride in community involvement. Similarly, many breweries have done an excellent job of serving as not just local watering holes, but engaged and valued parts of the community. In addition to simply supporting local nonprofits, many are finding unique opportunities to advance their social responsibility efforts. Of course, they tend to play a large role in community events, but it is also increasingly common for these breweries to launch their own initiatives that help to fulfill a charitable mission. Individual breweries build community volunteer teams, frequently donate goods/proceeds, organize events, and provide space for community gatherings, among other things. These initiatives have been extremely successful in getting not only the organization’s employees involved, but community members, from 21 years of age to retirees. In fact, I regularly work/volunteer with more than a handful of people that do not even drink beer but are happy to spend their time/money supporting these initiatives. How are your efforts engaging those that are not employees or members? 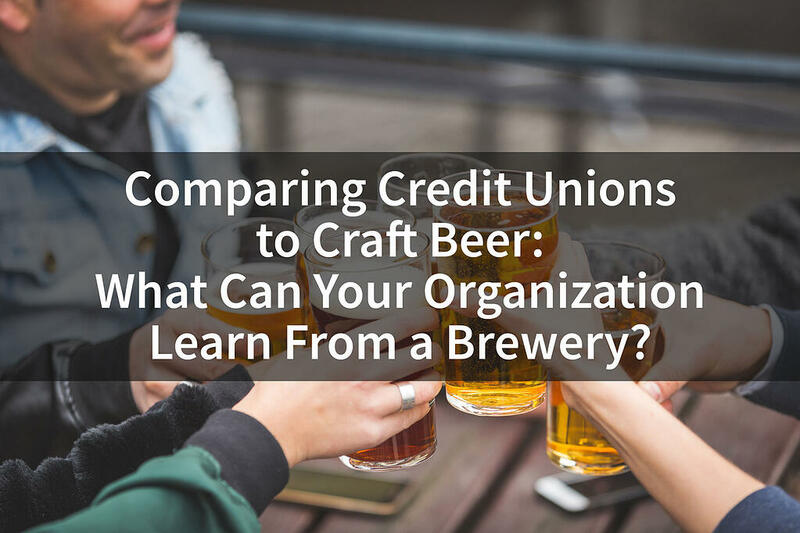 How can you position your credit union as a key part of the community, rather than just a financial institution that contributes to the community? The collaborative spirit of credit unions is not found in many other industries. Craft beer, however, has been harnessing the value of collaboration, and using it to grow the movement nationally. This is visible in a variety of practices. Breweries will create “collaboration beers”, for which two or more breweries work together to produce a new beer. In this endeavor, brewers from each business will work together to create a new recipe, physically brew together at one of the sites, and brand the result with both/all their logos. It’s challenging to think of a better example of businesses working together that could be competing for market share. Breweries will also frequently participate in sampling events, brewery crawls, craft beer passports, and other opportunities that are designed with the intentions of collaborating and promoting the whole community rather than competing against each other. By applying this collaborative spirit, credit unions have made great achievements through initiatives such as shared branching and ATM networks. However, there is massive unrealized potential for credit union collaboration – especially as it applies to data and analytics. Defining a proper data strategy is imperative for all credit unions, but to fully leverage available data is more than a typical credit union can handle. Credit unions need to be focusing on forecasting and advanced analytics but cannot do so until data is standardized and integrated. Credit unions are spending too much time “re-inventing the wheel”, building reports that are similar across peer groups when they could be leveraging the reports and models built by other credit unions. With a standardized data platform, credit unions can share reports and analytic applications, regardless of core or other technology. Even with integrated data sources and mastery of descriptive and prescriptive analytics, many initiatives such as predictive modeling, or meeting the CECL regulations, requires massive data sets. Individual credit unions simply lack sufficient data sets for proper confidence. The common standardized data platform also empowers credit unions to seamlessly pool de-identified data and collaborate for improved advanced analytics. These challenges are extremely challenging for an individual credit union, but improved opportunities for collaboration means credit unions are in a fantastic position to launch analytics within the community forward, and ultimately revolutionize the industry. The culture of supporting local businesses and the appreciation for quality goods/services in America has allowed the craft beer community to thrive. Credit unions share these same values, it’s not too late to take advantage. There is tremendous opportunity for credit unions today. It is time for the credit unions to come together to collaborate on analytics and transform the credit union industry.